Home Staging Quiz – Does My Property Need Home Staging? Should your home be staged? Play this home staging quiz to see if professional home staging is right for your property! The top 3 key factors that determine how quickly a property sells are location, price and condition. Home staging helps to take care of the condition (not to mention can help get the best offer possible). According to HomeGain, it generates a 196% return on investment. That means every $1 you spend wisely, will return $2 back. Not every property will need updates, however deferred maintenance isn't just on the buyer's want list, it's expected. What updates have you done to your property? Have you compared your property to your competition's? Strategically chosen updates can transform a property into your buyer's next home. How does the condition of your property compare to others on the market? Not only is it a relief to sell your home as soon as possible, it's also very costly if your property doesn’t sell as quickly as you wanted and you end up having to reduce the price plus pay monthly carrying costs (mortgage, insurance, utilities, taxes, etc). How long has your property been on the market? What is the average time your competition takes to sell? The decision to sell your property while living in it or leaving it vacant is a touchy one. Each scenario has unique challenges. Buyers have difficulty envisioning empty rooms: vacant spaces seem smaller, cold and life-less (not to mention carrying costs add up quickly). Living in your home while selling can also be stressful: keeping up with cleaning and de-cluttering every day while still living in your home. The faster a property sells the better right? Is your property lived-in or vacant? Everyone has such unique and creative ways of expressing themselves in their homes. Unfortunately the way we live in our homes is different than the way we sell homes. What type of buyer were you when you purchased your property? We each know what works for our current/future lifestyle, but what will work for the buyer? What type of buyer are/will you be for your future property/home? 90% of buyers cannot visualize tweaks in furniture placement, paint or personal decor and will choose a home that is move-in ready based on their personal taste. Is your property geared towards the correct demographic? 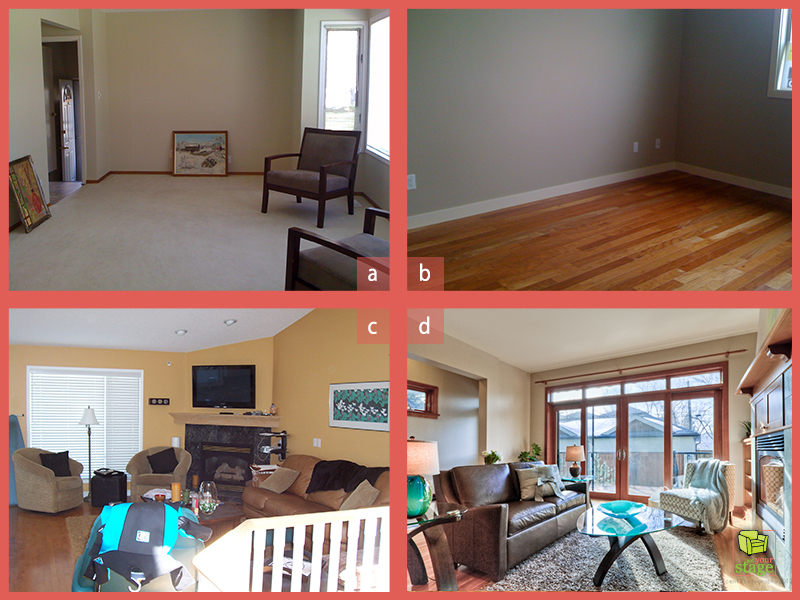 Which photo best represents your property's living room? A) I have furniture, but need help accessorizing/making the room appeal to my target buyer. B) I don't have any furniture/artwork/accessories and I need help making the room appeal to my target buyer. C) I have all the furniture/artwork/accessories, but need help arranging the room to appeal to my target buyer. D) I feel my living room looks stunning and would just like a second opinion. 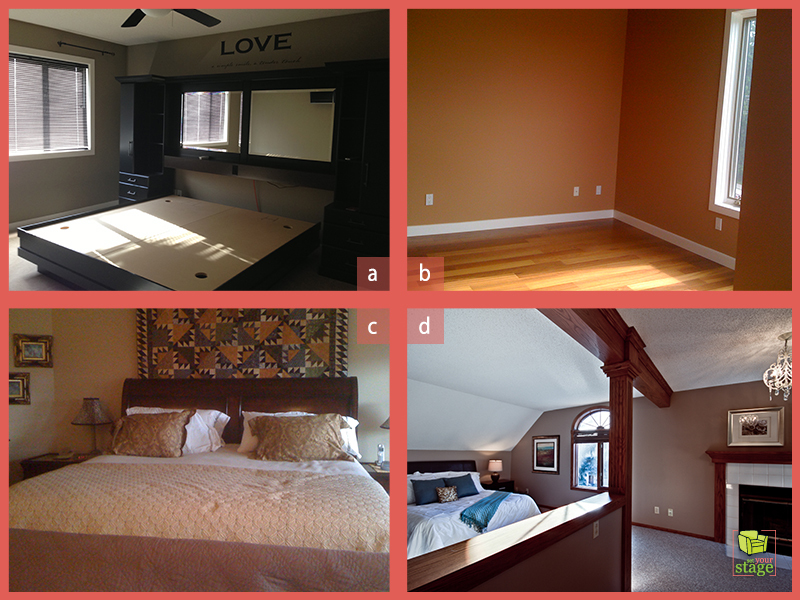 Which photo best represents your property's master bedroom? According to HomeGain, home staging generates a 196% return on investment. That means every $1 you spend wisely, will return $2 back. What budget did you have in mind for preparing your property for sale?